Every Monday during lunch the DataWing team hosts a professional development lunch & learn. It is an open event to all the other companies in our building that we have good relationships with and we usually get one or two folks to sit in with us. It’s a great way for us to grow as people, which in turn helps strengthen our business. The format is pretty simple. We watch a short video on a topic (frequently a TED Talk or something similar) and then have an open discussion about it. In several recent sessions, we have been discussing the Law of Diffusion of Innovations. It was originally described by Everett Rogers, a professor of communications studies and describes how novel products or ideas are spread among a social group. 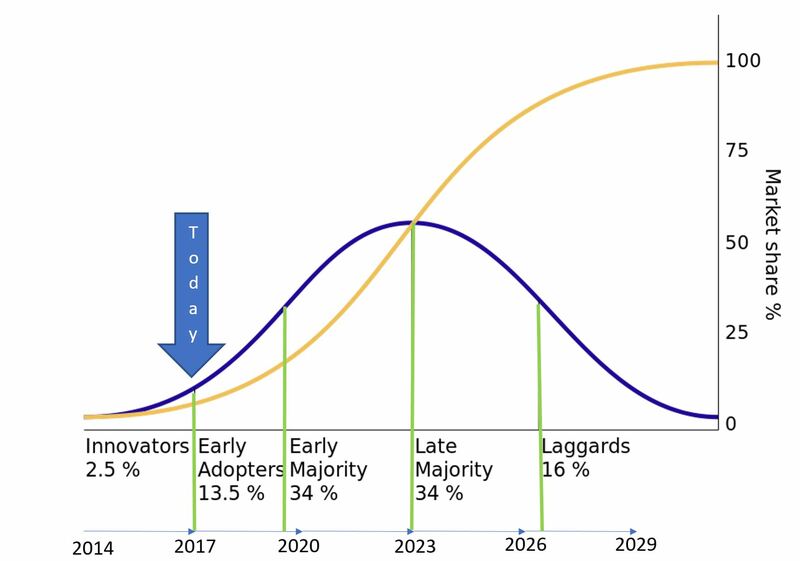 In the chart below, there are two curves that represent the diffusion of innovations concept. The blue line resembles a “bell curve” that most readers are familiar with. The yellow line is a cumulative depiction of total market share. They are two ways to look at (basically) the same thing. Innovators: “Innovators are willing to take risks, have the highest social status, have financial liquidity, are social and have closest contact to scientific sources and interaction with other innovators. Their risk tolerance allows them to adopt technologies that may ultimately fail. Financial resources help absorb these failures.” Think of these people as the “Innovation” department that most major companies have. Early Adopters: “These individuals have the highest degree of opinion leadership among the adopter categories. Early adopters have a higher social status, financial liquidity, advanced education and are more socially forward than late adopters. They are more discreet in adoption choices than innovators. They use judicious choice of adoption to help them maintain a central communication position.” I think of this as the operational leaders in an organization that are willing to “try out” the things that the innovation team is recommending. 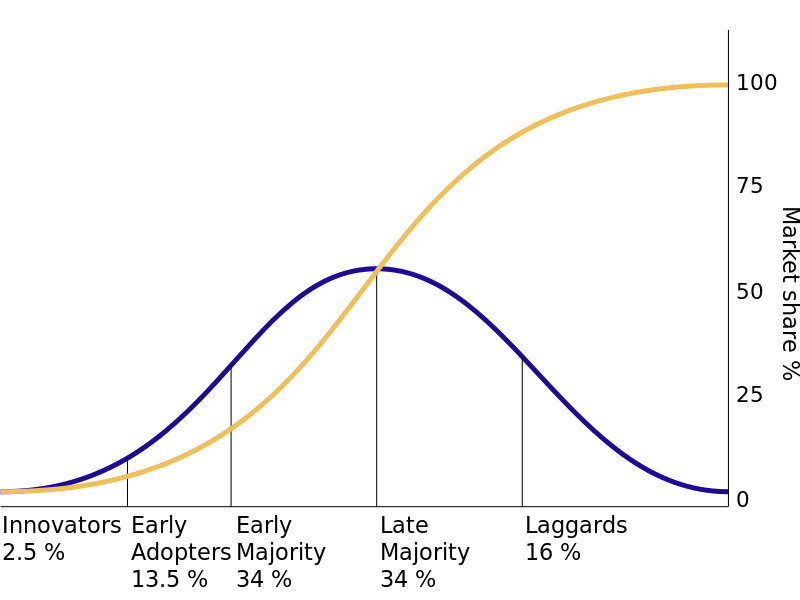 Early Majority: “They adopt an innovation after a varying degree of time that is significantly longer than the innovators and early adopters. Early Majority have above average social status, contact with early adopters and seldom hold positions of opinion leadership in a system.” For me, this would be the field operators that are willing to use new technology, but only if it is brought to them. They are not, necessarily, out there seeking new ideas. Late Majority: “They adopt an innovation after the average participant. These individuals approach an innovation with a high degree of skepticism and after the majority of society has adopted the innovation. Late Majority are typically skeptical about an innovation, have below average social status, little financial liquidity, in contact with others in late majority and early majority and little opinion leadership.” These are the folks that will let everyone else work out the bugs of a technology before they adopt it. They view new technology as a risk and can’t afford to be wrong about it. Laggards: “They are the last to adopt an innovation. Unlike some of the previous categories, individuals in this category show little to no opinion leadership. These individuals typically have an aversion to change-agents. Laggards typically tend to be focused on “traditions”, lowest social status, lowest financial liquidity, oldest among adopters, and in contact with only family and close friends.” These are people who say “I’ve never needed it before, why do I need it now?” and are the most difficult to persuade. My experiences in the industry lead to the conclusion that we are in a transition from the innovators to the early adopters. In the most forward leaning industries we work in I’m seeing the “drone stuff” just starting to move out of the innovation departments and into the operations environment. Notably, this is occurring on a small scale. These hand-offs are leading to pilot projects or small evaluation periods. By reviewing the Law of Diffusion of Innovations it is easy to see that we are just getting started in the commercial drone industry. There is a lot for us all to do to keep it healthy and to keep marching forward. The next major hurdle for our industry will be the transition through the early adopters to the early majority. This is going to require a flawless ecosystem of products that enable an easy integration into existing workflows. Without an ecosystem to support the aircraft, the hardware will be like HDTVs before there were consistent HD signals.. nothing more than a novelty for techies. For a robust explanation of this concept, check out this Harvard Business Review article (https://hbr.org/2016/11/right-tech-wrong-time?referral=00060). I’m happy to see our industry shifting the focus from hardware to the software that supports the end user. That will be the necessary step to get us to the next phase!